Since we have been packing and our schedules have been all over the place we have found ourselves eating at 9pm / 10pm at night and who really wants to cook that late at night? So our diets have consisted of super convenience foods many of which are not the healthiest- I am also trying to avoid grocery shopping so our meals have been full of pantry hodgepodge. 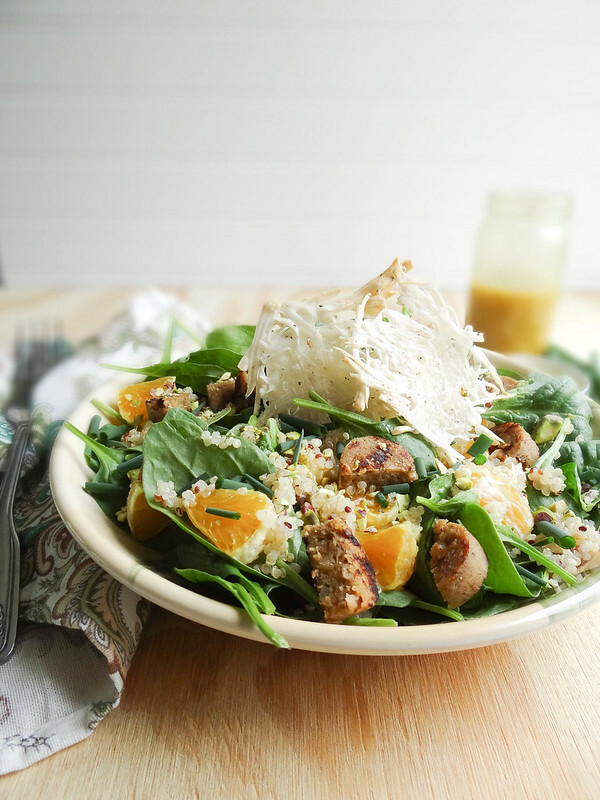 This salad is one of the last "real" meals I've whipped up for fun. 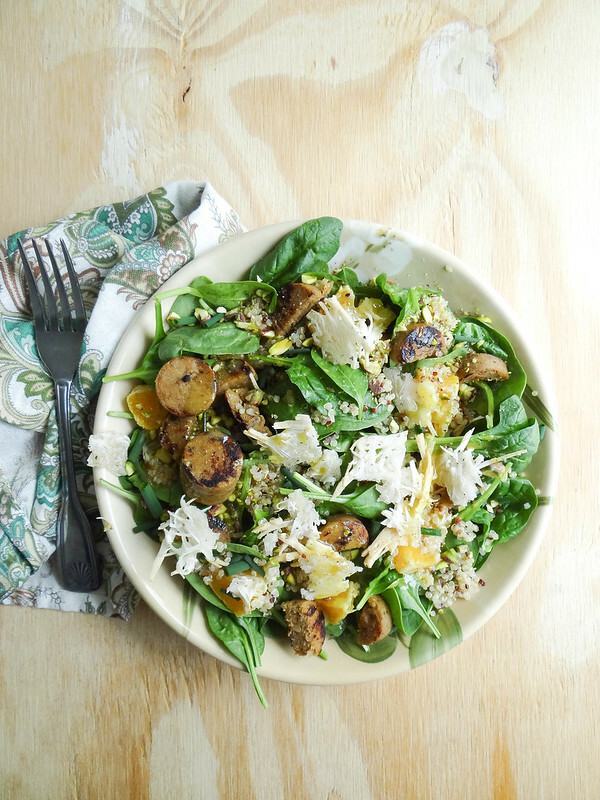 The Chao Cheese Crisps, Field Roast Sausage and Quinoa all finish at about the same time - if your have the quinoa already on hand cooked then this salad comes together in a flash. 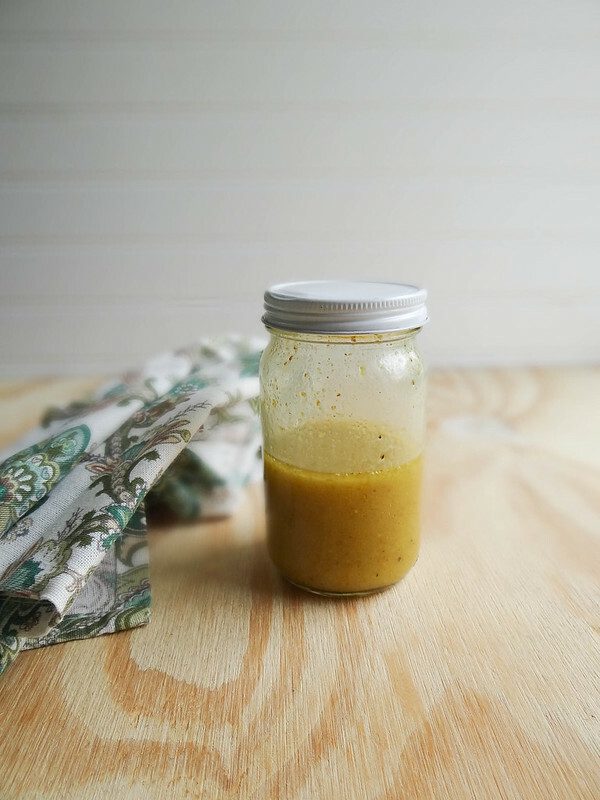 Any tart vinaigrette will work, the recipe I provided down below is my go to. Keeping my fingers crossed that I will be back by mid August to regularly posting- I miss you guys and this space! While the oven is preheating, rinse quinoa in a fine mesh sieve under cold water. Bring 1/2 cup water to a boil in a small sauce pan fitted with a lid. Add quinoa, cover and reduce heat to low, simmer for 10-12 minutes. Turn off heat and allow to sit until ready to use. As your quinoa cooks, pan fry your Field Roast Sausage over medium heat in a bit of coconut oil until golden and cooked through. Remove from heat and set aside. 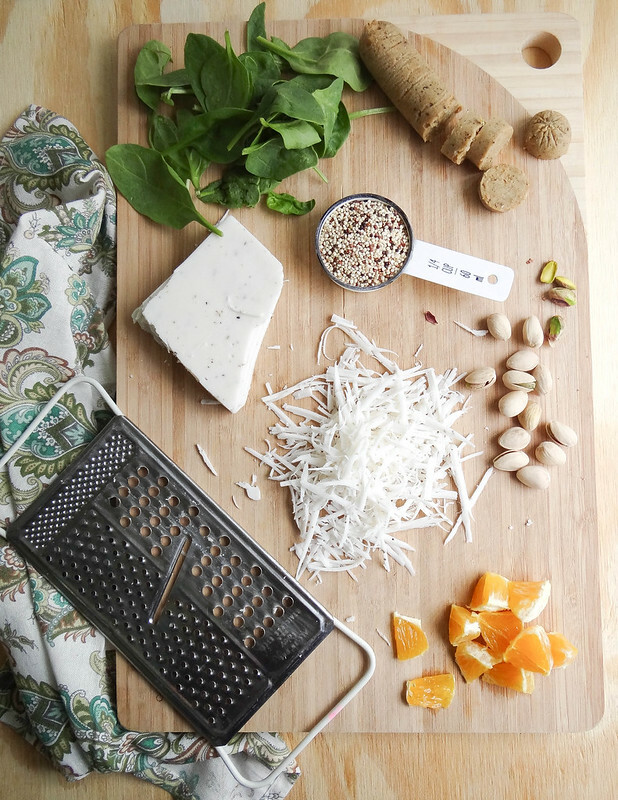 Shred your Coconut Herb Chao Cheese, a 1/4 cup at a time mound the cheese onto a small baking sheet lined with parchment paper or a nonstick baking mat. Bake until edges begin to turn golden and cheese melts, about 10-15 minutes. 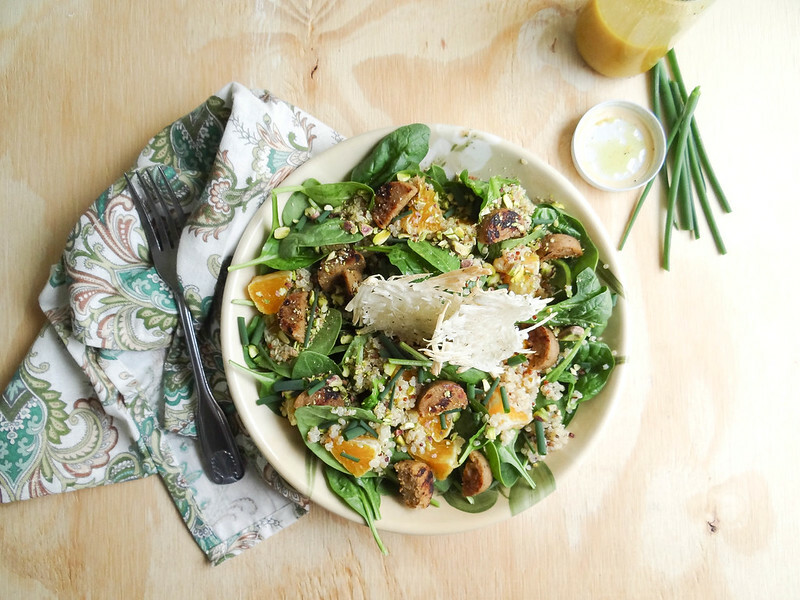 To make your vinaigrette, place all ingredients in a jar fitted with a tight lid + shake until your dressing comes together. 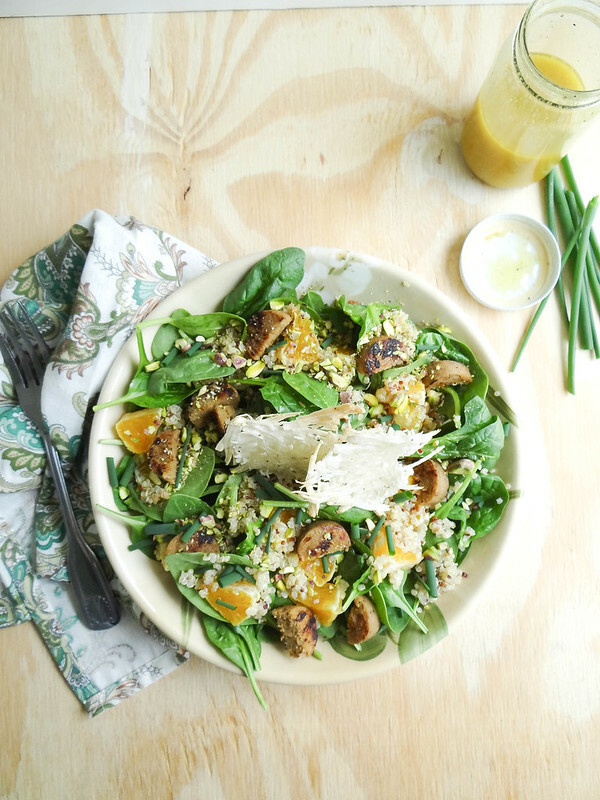 Place your spring greens or baby spinach in a bowl, top with quinoa, cooked Field Roast Sausage, orange pieces, pistachios or sunflower seeds. Drizzle with vinaigrette and top with fresh chives + Coconut Herb Chao cheese crisps. 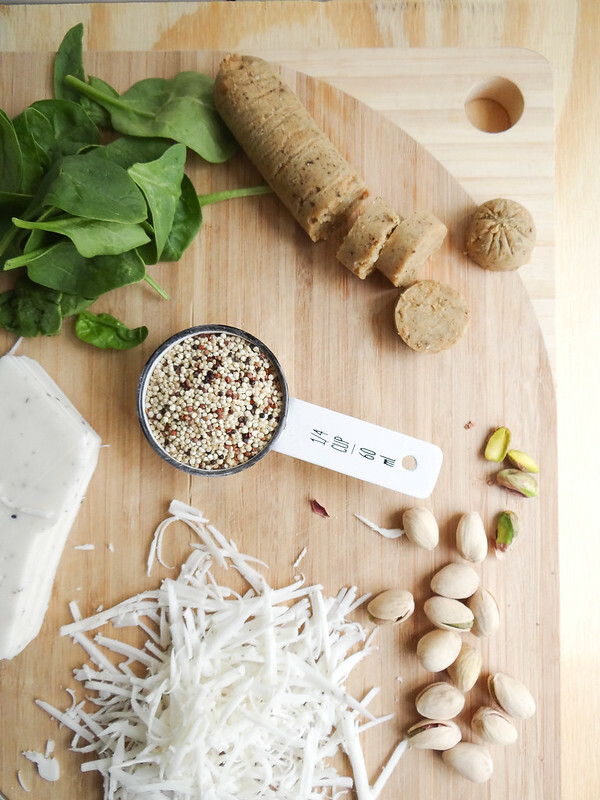 It's really great that you shared you recipe for this salad. Healthy and Nutritious, that's what I love about it. I'm buying some ingredients to make this. Oh great, this looks delicious and very healthy. thankyou for this. Quinoa Recipe with cheese .. This is what finding.. I will ask my friends for the things that used here..
That's a great tutorial! By the way, you can find more good tutorials at this site, guys! My mic check is life or death, breathing a sniper’s breath I exhale the yellow smoke of Buddha through righteous steps view here. There are soul food recipes but native foods are always tasty and healthy I am one of Professional Assignment Writers and I have done research on food recipes and at last I found native food is always good for your health.